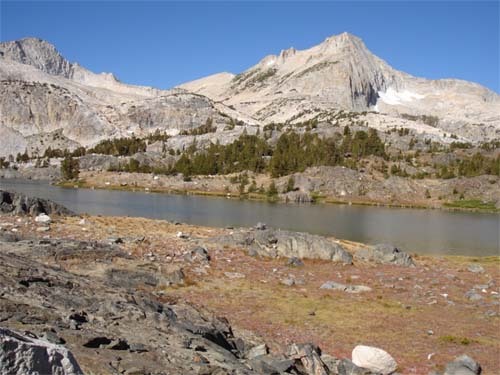 One of my favorite ways to start the fall fishing season is to camp in the Tioga Pass region and day-hike into the various lakes in that area. The brookies set up to spawn in September and October, so they are in brilliant color, and they are feeding up for a long cold winter. This year I camped at Toulomne meadows the week of September 15. The web-based reservations said it was full, but there were lots of drive up sites available from Monday through Thursday. I chose to sleep in the car to keep it simple. 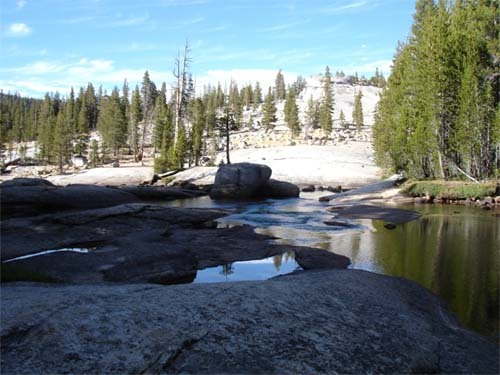 Sites are also available at Tioga Lake, Saddle Bag Lake, and at the turn-off to Saddlebag Lake. The day I arrived, I walked up along the Toulomne River. 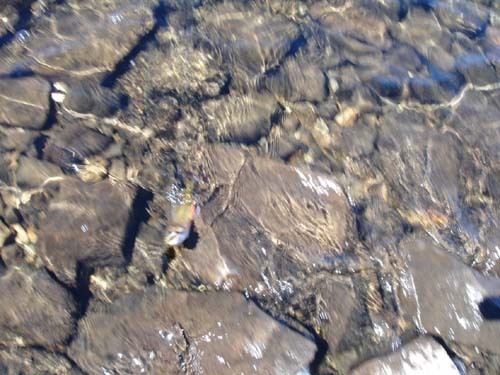 It was low, clear, and small trout were in evidence. I saw lots of deer. I did not fish. At my age altitude adjustment takes a while. Day two I hiked into Gaylor Lake. It is near the exit at Tioga Pass. The hike in is a mile, but steep. There was no rush, and I got to the lake at 10 am… taking an hour to get there. The scenery on the way up is spectacular of the meadow and Mt Dana in the distance. As you crest the saddle, you can see the 4 lakes nestled in the valley ahead of you. I only stopped at the first lake. From past experience I can share that they all have fish. This time I only worked the closest lake. It was full of water. 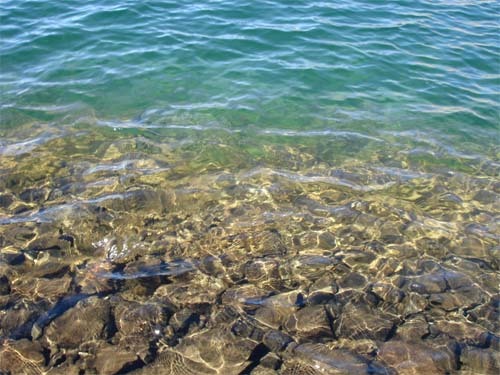 The water was crystal clear, and I could see fish searching for food along the edge. They did not seem to like Stimulators, or Adams this year. (In the past they wanted orange Stimulators, or Grasshoppers.) However, a Stillwater nymph and soft hackle dropper worked magic. By lunch, I had caught 12 trout and lost several. After lunch and a nap, I caught 5 more in the next hour. All were 10-11 inches, big heads, skinny bodies. They were hungry. Day two I went over to Saddle Bag Lake and took the boat shuttle across for $11.00 round trip. At the advice of the operator, I wandered over to Green Lake. It is very nice. With some stealth I was able to catch and release 7 fish of around 8 inches. These were also brookies. The magic here was not a pheasant tail, more Stillwater nymph, but a #18 midge pattern with wings. The boat operator reported that Conness Lakes are now producing 12-14 inch Goldens that were planted some years back. Conness lakes are up the inlet stream to Green Lake. I have not been there. Maybe next time. 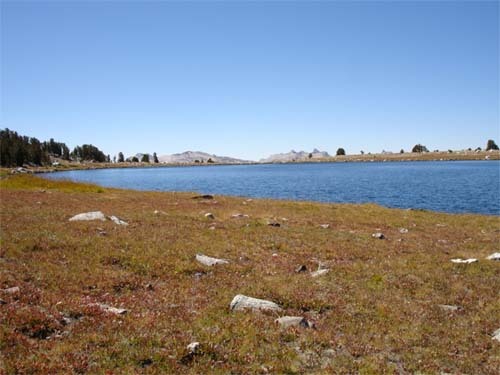 There are a number of lakes around the loop at Saddle Bag Lake. In the past they have all produced fish for me. Day 3, I went back to Saddle Bag and fished the main lake where the shuttle lands. The first cast produced a 16” rainbow on a cast master (boo). Then I tried flies and caught 2 more on soft hackles. In late September, the water faucet may be frozen in the morning, but the temp is in the 60’s by mid day. The air is crisp and clear. It is good for the soul. There are other lakes that do well in the area: eg. Elizabeth Lake, and some secret haunts.